Chic sophistication seamlessly intertwines with dynamic energy in the unique Seattle community of McGraw Square at Queen Anne. Designed to fit into Queen Anne's eclectic architectural composition, these luxury townhomes suit a variety of styles, and complement existing structures. An extraordinary blend of contemporary, craftsman, and classic row architecture in 57 luxury townhomes is set within the inviting parks, panoramic views, and quiet tranquility of Queen Anne, yet is just minutes from the vibrant night life and bustling business districts of Seattle's city center. 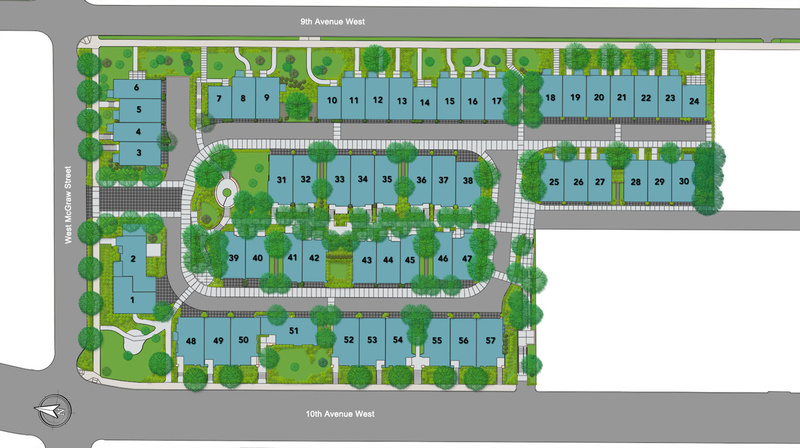 Find your new home by viewing our site plan! Open concept floor plans. Generous living, dining and kitchen spaces. Expansive, light-filled windows and high ceilings. Each 3-bedroom townhome at McGraw Square at Queen Anne feels as wide open as its views of the city of Seattle. And with a gourmet kitchen and Kohler fixtures throughout, the practical blends seamlessly with the beautiful.